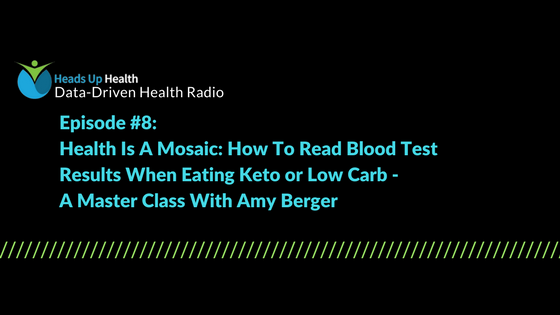 Join Dave Korsunsky as he interviews Amy Berger of Tuit Nutrition on how to read blood test results as part of your low-carb ketogenic lifestyle. Amy breaks down all the important facts on how to read blood test results, which ones to keep an eye on and how to interpret your own test results through a low-carb/ketogenic lens. This podcast is a continuation of Amy’s in-depth blood chemistry master class on the Heads Up Health blog. Check out Amy Berger’s full series of “Low-carb Lab Testing” blog posts here. Amy Berger is a USAF veteran, who holds a master’s degree in human nutrition, is a Certified Nutrition Specialist (CNS) and certified Nutritional Therapy Practitioner (NTP). She is a low carb/keto/paleo nutritionist, author of The Alzheimer’s Antidote, and blogger at Tuit Nutrition. She can also be found on Twitter. If you’re new to, or considering a low carb lifestyle, this podcast will help you understand which labs to ask your doctor for and how to read blood test results to empower your health. If you’ve been at this for a while, you’ll gain a deeper understanding of what your blood sugar test results mean. You’ll learn which labs you should be paying attention to, as well as what to do when your doctor or insurance won’t get you the labs you need. How Heads Up Health brings metrics from all your tracking apps together including blood test results. The reasons why hyperinsulinemia can indicate a system out of balance and how the body is overcompensating for elevated blood sugar levels.